When you think of the Dogwood Tree, you probably envision different trees depending on where you live. 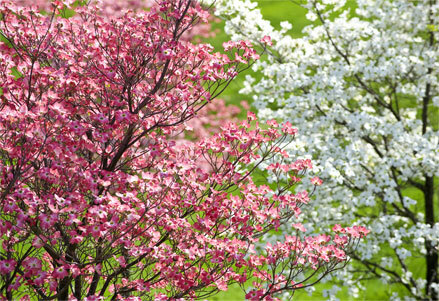 If you live in Eastern North America, you’ll think of the white or pink Flowering Dogwood, a hallmark of spring. If you live in Western North America, Eurasia, or Eastern Asia, you are probably more familiar with a non-flowering variety, or a variety that produces edible red fruit. Also referred to commonly as “Hound’s Tree” or “Whipple Tree”, the Dogwood is known for its remarkably hard wood, used in specialty tool handles and walking sticks by artisans. While the Dogwood is most notably an ornamental tree, particularly in North America, some varieties, like Cornus kousa and Cornus mas are sold as fruit trees. Cornus kousa trees bear a sweet fruit with flesh that tastes like a tropical pudding, while Cornus mas produce fruits that are both tart and sweet when ripe. Another variant, Cornus officinalis, is prized in traditional Chinese medicine, where it is used for weakness, dizziness, lower back and knee pain, or to treat excessive sweating, uterine bleeding, or bladder incontinence. Although there are nearly 60 different varieties of Dogwood trees, we’ll focus on the Flowering Dogwood, which is the most popular variety in horticulture, and the variety most likely to be chosen for a garden. The Flowering Dogwood ranges in color from a pristine, soft white to a vibrant pink or red, and generally bloom for about two weeks out of the year in early spring, typically April or May, although they may bloom for up to four weeks. All dogwood trees should be planted at a depth of approximately two-thirds the length of its root ball, with the soil gently mounded around the sides, with no soil over the top of the ball, which should be slightly above ground level. Plants should be grown between 6 and 20 feet apart, depending on the expected size of the mature tree. Water your dogwood thoroughly and regularly until it is established, then water once a week unless the weather is unusually hot or dry. During hot, dry weather, dogwoods should be watered regularly. During normal weather, flowering dogwoods should be watered once a week. Pruning is seldom necessary except to remove dead or injured branches, suckers, or diseased and insect infested parts. You may also prune to shape your dogwood into a more attractive shape. Summer is the most ideal time to prune dogwoods, as they bleed sap if pruned in winter. If you prune too soon, you may stunt next season’s flowers. Compost should be added under the tree each spring, spreading out to the dripline. If mulch is desired, add a 2 inch layer around the base to reduce weed growth. A typical healthy, mature flowering dogwood can be expected to reach a height of between 15 to 30 feet, with a spread of 15 to 20 feet. Other variants of dogwood come in smaller sizes, with the most common shrub dogwoods growing from 6 to 20 feet tall and wide. One of the smallest varieties is a ground cover form that only grows from 3 to 9 inches tall. Dogwoods are versatile plants that do well in acidic, loamy, moist, rich, sandy, well drained, and clay soils, preferring moist conditions to dry. Flowering dogwoods do best with well-drained, rich soil, while other varieties prefer more acidic soil. Dogwoods prefer a minimum of 4 hours of full sun each day, with the rest of the day spent in partial shade. Buds begin to form on the trees in late winter, blooming for 2 to 4 weeks in April and May. The ornamental appeal of these trees may seem strange when you consider the short blooming period of the dogwood, but they make up for the short blooming period in other ways. In the summer, the spring blossoms are traded for light green leaves and the shade they bring. As the season turns to fall, those leaves turn a vibrant red. In winter, the alligator-like texture of the bark is its main ornamentation. The Japanese dogwood blooms later than other flowering varieties, blooming in late spring and early summer after the leaves have already unfurled. Flowering dogwoods can be expected to grow in hardiness zones 5 through 9. 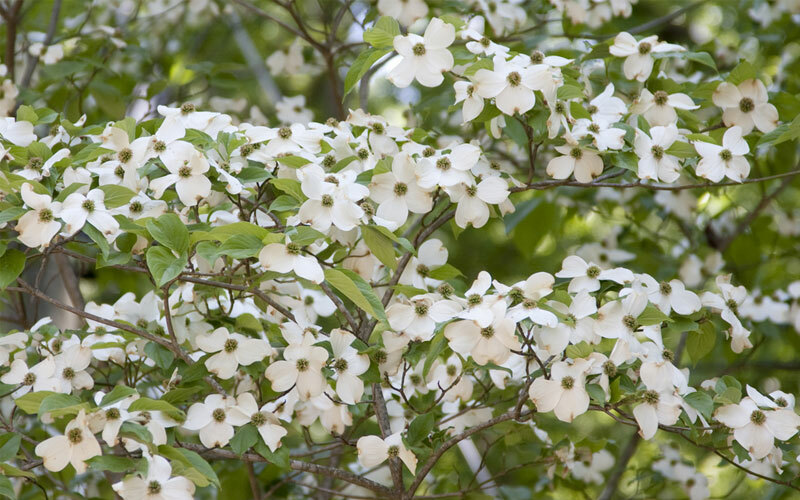 Aphids and mildew can be a problem with dogwoods, but applying a fungicide and horticultural oils in spring can help prevent these minor pests. The disease that most effects dogwoods is the dogwood anthracnose fungus, which can be identified by light brown spots on the leaves that spread to the twigs, main branches, and then to the trunk, often killing the tree within two to three years. Planting your tree in a spot where they receive morning sun and good air circulation, and raking your leaves during the fall to reduce rot near the base of the tree can prevent this fungus. In addition to the wide horticultural use in the United States, the flowering dogwood is the subject of several legends. One of these legends is from the Cherokee people, who believed that a tiny race of people lived in the dogwoods and watched over the elderly and infants. Dogwoods are also the subject of a Christian legend dating back to the early 20th century, which claims that the dogwood tree was used to create Jesus’ crucifixion cross and was changed into a smaller form to prevent it from ever being used for such a purpose again. While the story itself is pretty, dogwoods are not native to Israel or Palestine.